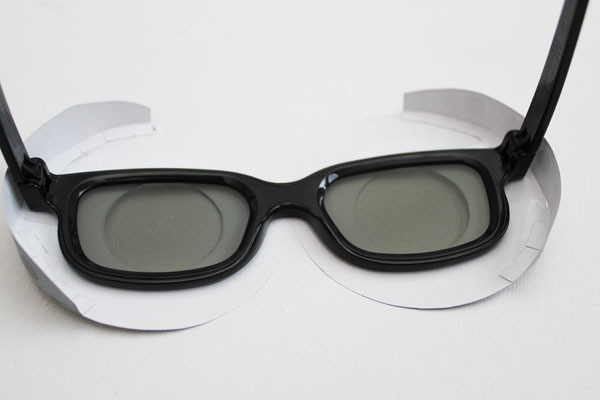 Take your movie theater 3D Glasses and turn them into 3D Minion Goggles with this free printable! (Update: some people had trouble accessing the template on Google. I’ve also uploaded it to Box.com. You can find it here.) I’ve made 2 to a sheet so that you can print two covers at a time – print them up, cut them out, and tape or glue them together. 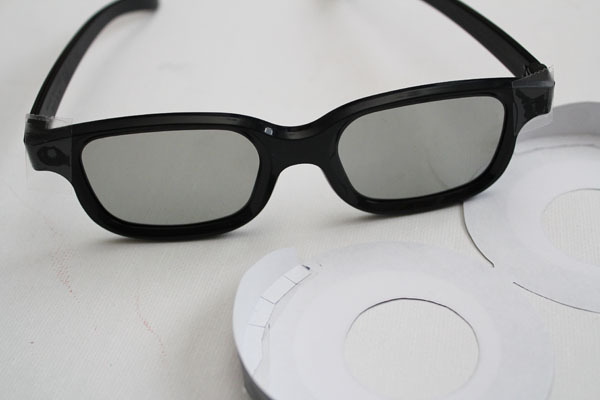 Make sure that you take some tape with you to the movie theater to see Despicable Me 2 so that you can attach your 3D Minion Goggles! We wore our Minion Goggle 3D glasses when we went to see Despicable Me 2. My husband, 4-year-old son and were among the first to see the movie, and we all loved it. We are big fans of Despicable Me around here. My son calls it the “Minion Movie”. And there are plenty of Minion antics in this sequel. Perhaps too many for me. In Despicable Me, many of the antics were of the sweet, toilet-brush-turned-unicorn variety. In this movie, the antics were more along the lines of space-ship-knocked-over variety. Which are funny for kids to watch, but things that moms don’t want their children to mimic. Despite a few of these moments, we really did love seeing the movie. I enjoyed seeing Gru grow as a character, and as a dad. And Dave and Steve and the rest of the Minions really are charming… in their own well-meaning way. 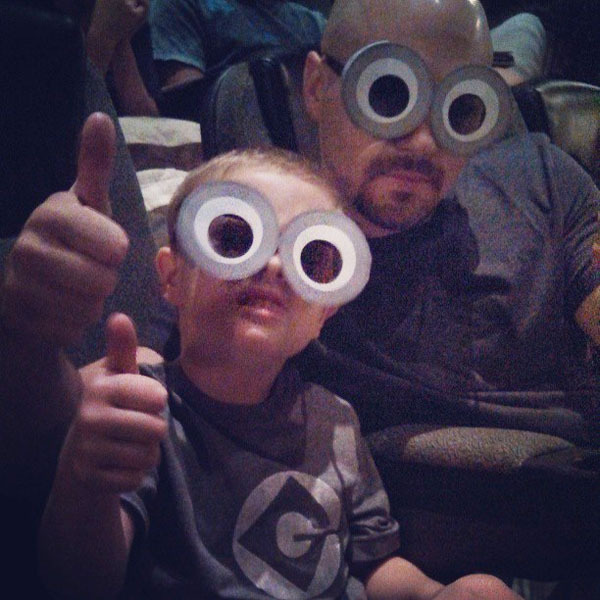 Here are my boys in their Minion Goggle 3D Glasses at the theater, getting ready to watch the show. 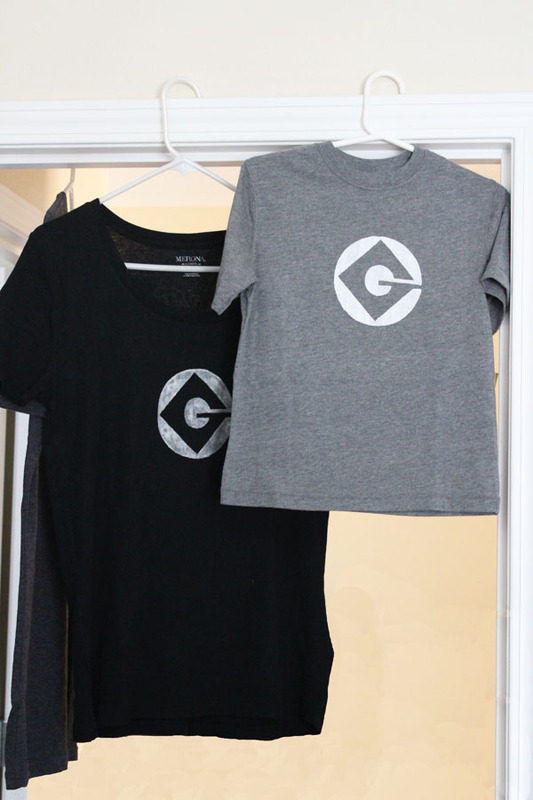 They are also wearing Gru-logo t-shirts (the logo on my hubs’ shirt is a little hard to see in this lighting), I’ll share that with you at the end of this post. Start by printing the 3D Glasses cover. You can find it HERE. (Update: some people had trouble accessing the template on Google. I’ve also uploaded it to Box.com. You can find it here.) Each page prints 2 covers. 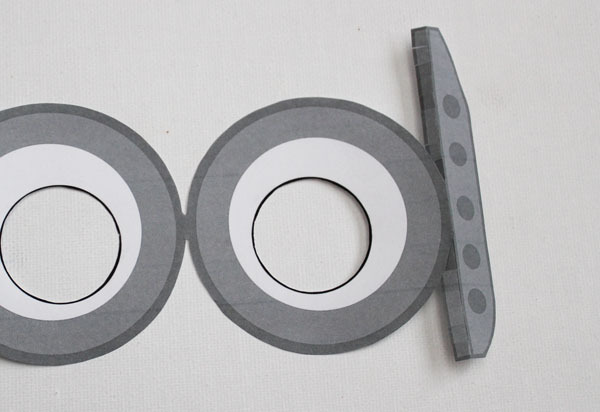 Cut out around the shapes, and cut out the center black holes. Cut slits along the straight lines on each side of the glasses, each slit about 1/4″ apart, up to the dark grey straight line. 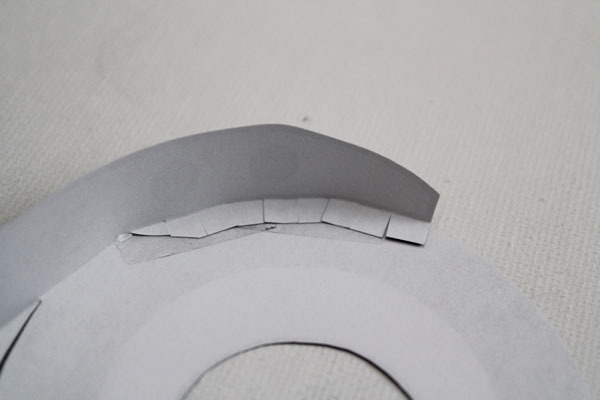 Fold the tabs you just cut in on the dark grey line. 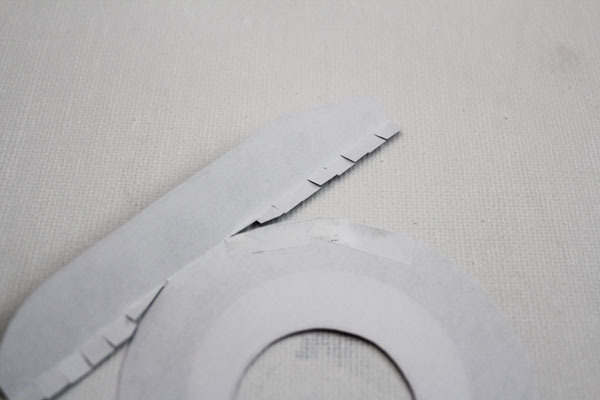 Turn the sheet over, and attach the tabs to the back using a glue stick or double-stick tape. Follow the curve of the glasses as you attach the tabs. If, like me, you grabbed glasses from when you went to see Monsters University, you can now put double stick tape on the front of the glasses. If not, bring the tape with you to the theater. 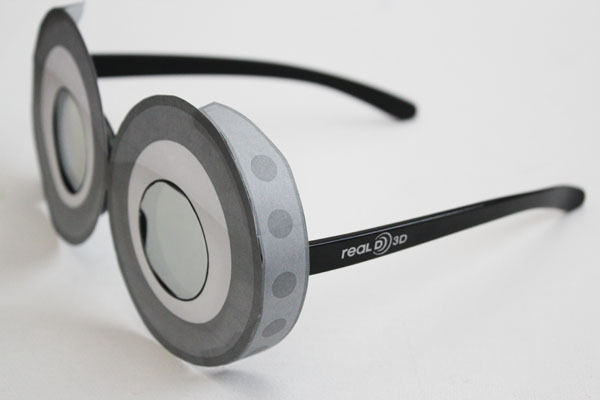 Line up the holes in the goggles with the lenses on the glasses, and attach the goggles to the front of the 3D glasses. 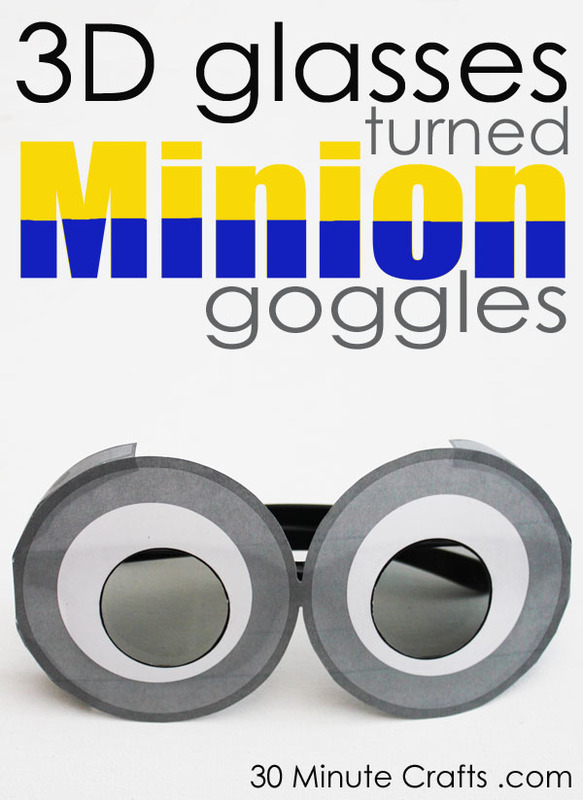 And just like that, you’ve turned your plain 3D glasses into Minion Goggles perfect for watching Despicable Me 2! You can take them off while watching the movie, if you like. My son and husband did. I kept mine on during the movie, and was able to see everything just fine. Of course, I had to make t-shirts to wear to the movie. Since I made a Mike Wazowski t-shirt for my son to wear to Monsters University, and now a shirt to wear to Despicable Me 2, I’m sure my son will be expecting a custom shirt every time we go to the movies. And I might have to oblige since they are so fun to make! For this shirt, I used a Freezer Paper stencil. I looked up the logo and printed it on a sheet of paper. I put freezer paper over it, and traced it out. It is important to have the shiny side of the freezer paper down. I cut out the logo and ironed it onto the shirt, shiny side down. The shiny side of the freezer paper has a plastic-y coating. This plastic melts just slightly under the heat of the iron. This temporarily fuses the stencil in place. I added a layer of freezer paper to the inside of the shirt as well, to protect the paint from soaking through the front and into the back. Using fabric paint, I filled in the design. While the paint is still wet, I carefully peeled up the freezer paper, and let the shirt dry. It was that easy! These are really cute! What a fun project. Just google “gru logo” or “gru logo image” and you’ll get tons of results. If you do a regular Google search, then click on “images”, then click on “search tools” you can sort by image size. Using a larger image is often easier. where did you get the logo? I love it! Perfect for my son’s halloween costume this year. The link didn’t work for me though…any chance you can email the printable? You have some amazing ideas!!!!!!!! is there any chance you can please email me the link? sorry its so last minute, it just doesnt work. The link doesnt work for me as well. Can you please send me an email with the pdf?! Thanks! I love these goggles thanks for the idea!! but can you send me the link or something to my email please? the link isn’t woring. I used this for my 11 month old son’s halloween costume. Thank God i was able to take a few pictures before he ripped it apart haha figured as much since babies doesn’t like anything in their face or head. I am using this for the photobooth i’m making on his 1st birthday this december. Yes it’s a minion party! Haha THANKS SO MUCH FOR THIS EASY DIY PROJECT! This is amazing! I’m also having trouble with the logo 🙁 Is there any way you could please email me the pdf as well?! Thanks for this post. We dressed up as Minions for Halloween at work and I hot glued the printout to a pair of sunglasses to complete my thrifted costume. I love the minions and this is super cute! I’ll have to give this a try. Thanks for sharing.